Just one year later, to the model year 1997, Porsche released the 993 Carrera S, internally 993 340 for the LHD (LHD) incl. the US version (here are 4 cars for the model year 1996) and 993 341 for the right-hand drive (RHD). As for the 993 Carrera 4S with the body of the Turbo, but with suspension and brakes ruled the cutbacks. 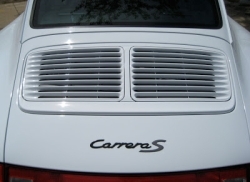 There the conventional components of the Carrera 2 were installed and also the all-wheel drive had been waived. One easily identifies the often "2S" called Carrera S by its black brake calipers and its divided lattice of the tail spoiler. At that time, rather launched as a "savings model", is the often as "2S" dubbed Carrera S today the most sought variant and scored with lovers usually the better price. The Carrera S obtained, because it significantly differed from the mature concept of the turbo looks, consequently its own M-Code:495 = Carrera S. The M-Code 491 and the extension "Turbo-Look" can be found on this model even internally no longer! Surprised, because all books show other counts and also Porsche indicating lower numbers? Each specified car can occupy the Turbo-Look Register with a chassis number. Less than shown are not possible! Porsche had already adopted in this final drive turbo-look model from the exclusive small series for WTL models. Up today the 993 Carrera 4S remains to be the last model, that got the M-Code 491in its certificates of birth and is with a wide margin the best selling modellvariant of the Porsche 911 with Turbo-Look. For capacity reasons, TLR list the 993 not online until someone is willing to take care for these cars.